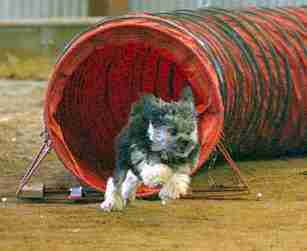 Lowchens of Australia presents the AGILITY LOWCHEN - "Pistil"! the fastest Löwchen on four feet! TayWil's Aerien Pistil Pete, OA, AXJ (known to his friends as "Pistil" and to his fellow competitors in the 12" jump height as "Da Bullet") lives in Houston, Texas, where he is owned, trained, handled and adored by Barbara Cecil. Born in Virginia (breeders are Herb Williams and John Taylor) in August, 2000, Pistil has been competing in AKC agility since September of 2001, and is the first Löwchen to earn advanced agility titles in the U.S. Pistil is incredibly fast (not incredibly precise yet, but that will come!) averaging 5 yards per second in Jumpers With Weaves, his favorite class. 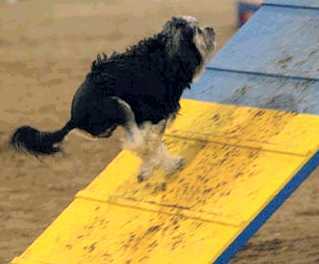 Several times in Novice and Open competition, Pistil had the fastest qualifying time of any dog, any jump height. He regularly outruns the Border Collies! Blessed with great play and prey drive, Pistil is always ready for a game. He's tough as nails, so he's never hurt, and is the world's greatest snuggle bunny and lap dog. He's also a bona fide hero: one night his insistence (licking, whining, nudging) that I get out of bed, roused me from the near unconsciousness of an insulin reaction and possibly saved my life. What a boy! Pistil (TayWil's Aerien Pistil Pete, OA, AXJ) shall, from now on, be addressed as Pistil the Excellent, thank you very much! ;-} Saturday, at the Acadiana Kennel Club AKC agility trial outside Lafayette, Louisiana, Pistil earned his AXJ - Agility Excellent Jumpers - title. Not only is Pistil the first Löwchen to earn the AXJ, he did it in 3 straight shows, with 3 scores of 100, and 3 first places, with an Excellent A Jumpers With Weaves average of 4.45 yards per second. To give you an idea of how fast Pistil is, Saturday's Excellent JWW course was 177 yards long; the judge gave it a standard course time of 52 seconds. Pistil ran the 20 obstacle course in 39 seconds. 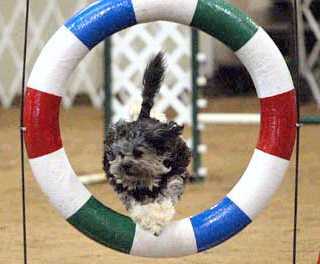 The second place dog, a Sheltie, ran it in 47 seconds; third place was a Papillon who ran it in 51 seconds. Pistil has only one speed - full speed ahead! I know I've got the numbers right, and I've done the math (110 yards divided by 21.27 seconds) several times, but the resulting number just boggles my mind: 5.17 yards per second! That's how fast Pistil (TayWil's Aerien Pistil Pete, OA, AXJ, NJC) ran his NADAC Novice Jumpers course today to earn his 2nd leg and NADAC NJC. In fact, Pistil had the fastest time of any dog, any jump height, in both Jumpers runs this weekend (there were 56 dogs in Novice, including lots of Border Collies ;-}), taking 2 first places. He also qualified and took first in Novice Gamblers, with the highest point total of any Novice dog. Boy, I just love taking my cute little foo-foo baby into the ring under judges who haven't seen him before. They always smile benevolently, as in "How sweet - a grandmother and her little lap doggie," then I tell Pistil to GO, and he blows all the competition away! Now that's my idea of fun! !